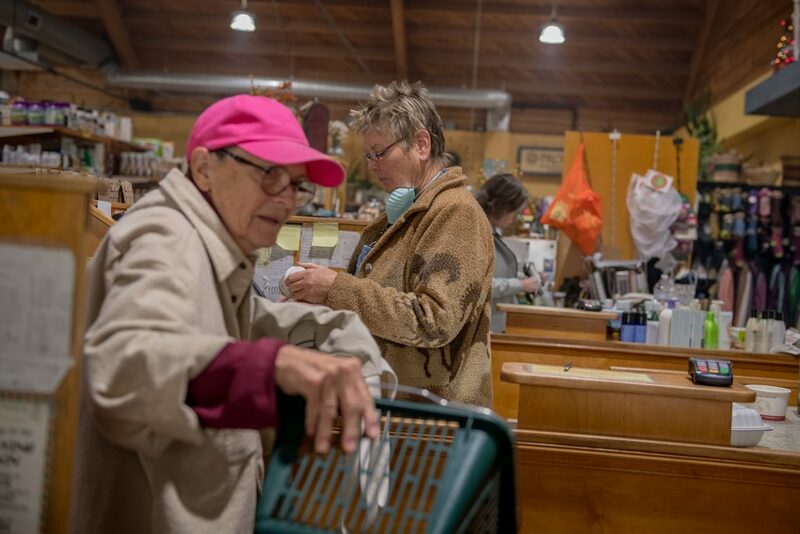 Mary-John Hart, left, picked up groceries at Rainbow Bridge, an organic store in Ojai, Calif., that remained open despite the heavy smoke and threat of the Thomas Fire on Friday. OJAI, Calif. — Ernest Niglio traded Brooklyn 20 years ago for healthy, spiritual living in this laid-back, picturesque town. His daughters could attend a vegetarian elementary school founded by a renowned Indian guru. He could practice meditation and the family could enjoy both the mountains and the ocean nearby. On Friday, Mr. Niglio, an owner of Rainbow Bridge, a popular organic grocery store downtown, was cruising the aisles in a protective mask. Ojai, about 90 miles northwest of Los Angeles, has long been a haven for nature lovers, spiritual seekers, artists, stressed-out urban exiles and Hollywood celebrities, all of whom felt protected by the pleasant valley surroundings and pure air. But for the last few days, Ojai has been at the center of the largest of several wildfires ravaging Southern California. The Thomas Fire, which has resulted in at least one death, has chewed through more than 140,000 acres in Ventura County, fanned by unpredictable winds that have battered coastal areas and inland communities like Ojai. Firefighters have been straining to contain blazes that have surrounded this town of 7,600. It has destroyed an unknown number of structures, including some of the multimillion-dollar homes in Upper Ojai. At night, fires in the distance have glowed like jack-o’-lanterns in the hills. By day, they have been barely visible from downtown Ojai, which has been enveloped in smoke. Few of the art galleries and spas that line the downtown streets have been open. Drivers turn their headlights on in the daytime. Ash has coated the pavement and cars like snowflakes. “If it weren’t so smoky, it’d be like a snowy day in New York, nice and gray,” Mr. Niglio said. 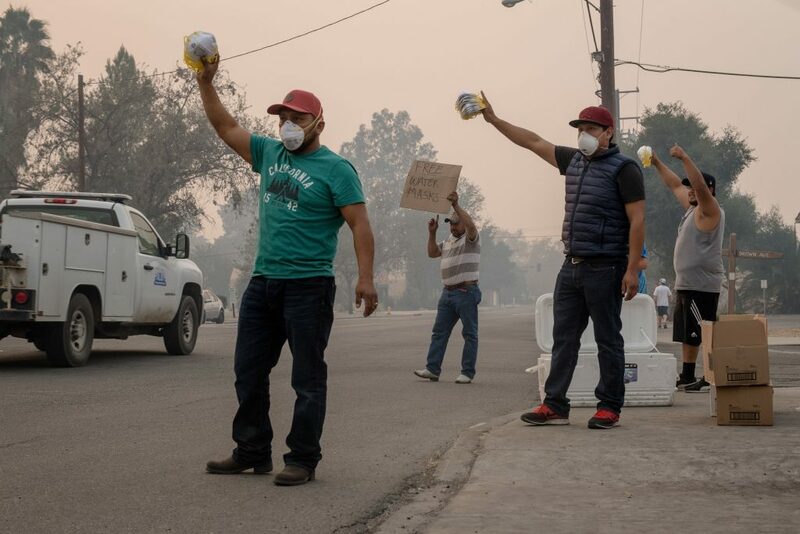 Rene Munoz, Lupe Borjas and Ramon Herrejon, from left, hand out free N95 masks and water in Ojai. People began to venture out on Friday as the smoke cleared slightly. They streamed into the post office, a few open restaurants and supermarkets, donning masks. Bart’s Books, where shelves lining the exterior of the store have titles like “Conversations with God” and “Where Do Bastards Go to Die,” was closed. But you could still pick up a book and throw coins in a slot in the door for the amount marked on the book. “To see my most beloved place on the planet broken like this is heartbreaking,” said Robert Lamarche, who makes “wearable art masks” and hand-sews Renaissance-period costumes. Mr. Lamarche, a Canadian artist with a Santa Claus beard, settled here 20 years ago and said he was received with “open hearts and arms” by gallery owners. His house in the mountains was not damaged but the power was still out. Just five minutes down the road, gutted homes and cars looked like something out of a “Terminator” movie. Mr. Lamarche and others knew that even if their homes were standing, they were savoring a false sense of security, because the Santa Ana winds were expected to intensify on Sunday and could bring more havoc to the heart of Ojai. “These are the worst fires I’ve ever seen in December,” said Jake Portillo, captain of a team of firefighters from Corona, in Riverside County, which had come to the aid of local crews. He said his team had battled blazes where entire blocks of homes had been decimated. Ojai’s name is derived from the word “nest” in the language of the Chumash people who originally settled here. It flourished in the early 1920s as a destination for people with respiratory illnesses. Among those who sought its healing power was Jiddu Nityananda, an ailing young man from India. He arrived in 1922 with his brother, Jiddu Krishnamurti. Mr. Nityananda died of tuberculosis a few years later. But his brother, the anointed messiah of the spiritual organization called the Theosophical Society, remained in Ojai and transformed it into a mecca for New Age pilgrims. It is often said locally that Ojai was the setting for a scene in the 1937 Frank Capra movie adaptation of “Lost Horizon,” which depicted the fictional Shangri-La. Whether the shot was taken in Ojai is a matter for debate, but regardless, it has helped burnish the town’s reputation as a real-life Shangri-La. 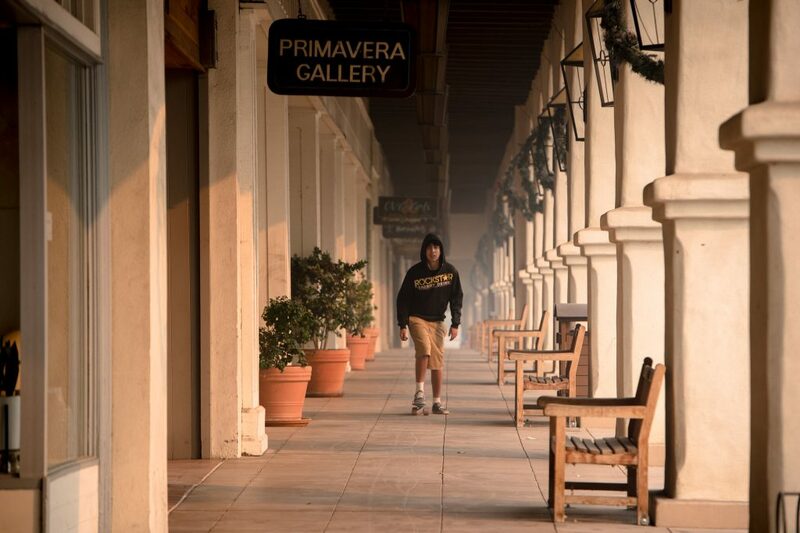 Downtown Ojai was cloaked in smoke on Friday, though it was spared from the flames. According to more local lore, Ojai boasts the most spiritual centers and massage therapists per capita of anywhere in the world. Typical of the old-timers is Lori Farrar, manager of Bonnie Lu’s Country Café on East Ojai Avenue, the town’s main thoroughfare. A crystal pendant hangs on a chain around her neck. From her pocket, she produced five stones — including an amethyst and a ruby — “to give me good energy,” she said. As the haze subsided Friday, Bonnie Lu’s filled with evacuees who had returned to check out their homes. Among them were Judy and Steve Quilic, a retired teacher and aerospace executive who moved to Ojai 15 years ago from Los Angeles. The couple had spent one night in a livestock center at the local fairgrounds, where the temperature inside had dipped into the 40s, they said, before springing for a hotel up the coast. Also returning to town was Henrietta Purcell, a former model who once appeared on the cover of a book by the photographer Helmut Newton. She has worked as a masseuse in Ojai for 20 years. PreviousPrevious post:The Diestel DifferenceNextNext post:We have a new job opening!